Cake jewellery is quite simply… dazzling! Be the first to have this exciting new concept at your celebration. 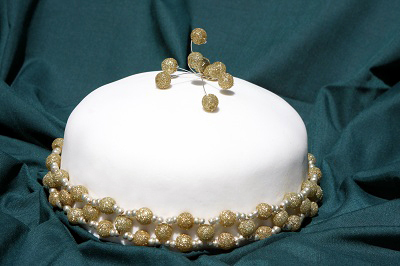 Using precious metals, Swarovski Crystals, diamante, pearls and a variety of beads, Stylish Celebrations will design and handcraft a unique jeweled item to decorate your cake with. Not only will you wow your guests with this stunning display, but once the celebration is over your piece will be a memory to take home with you, a treasured keepsake for life. For weddings our designer has endless ideas that will give you something fabulous and unforgettable. Use our cake jewellery at baby showers or Christenings, and then put the piece away in your child’s memory box. Have a monogram of your initials and the years you’ve been married made for your anniversary. These jeweled décor items can be used to adorn cakes at 21sts, retirements, birthday parties, in fact any occasion where there is a cake! Our Christmas jewellery will turn your Christmas cake into something awe inspiring, and it also makes for a wonderful and unique festive season gift. 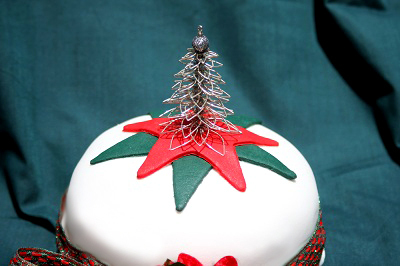 Once the cake has been enjoyed the jewellery can then be put onto your Christmas tree and used as an ornament year after year. We at Stylish Celebrations like to think of our Cake Jewellery as the most glamorous recycling you will ever do! All our cake jewellery is meticulously handcrafted. 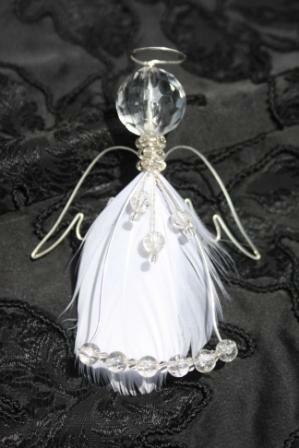 We have an exquisite range of designs to choose from which are made up within 4 to 6 weeks of orders being placed. Colours in these designs can be adapted according to your theme and décor. For a one of a kind, bespoke piece of cake jewellery, a consultation with our designer should take place 8 to 10 weeks before your celebration. Our wonderful designer, Mandy Smith, has been making beautiful jewellery for 13 years. She is a qualified goldsmith and has earned a reputation as the person to go to for all wedding and formal function accessories, including tiara’s, clips, hairpieces, jewellery and dress detailing. Mandy has a passion for what she does and this is reflected in every item she makes. Her attention to detail and craftsmanship ensures that each piece she creates is exquisite and of the highest quality. Let Mandy’s flair for the outstanding ensure that your celebration has a piece of cake jewellery that reflects who you are and captures the essence of your event perfectly. Stylish Celebrations is launching this beautiful product with a limited edition range of Christmas Cake Jewellery. All 4 pieces have been designed by Mandy Smith and will be available within 7 days of your order being placed. So simple and so pretty – brilliant idea. Thanks for letting me know T.
What a lovely idea and so pretty. Beautiful, will make great party favours. So pretty, such a good idea.